The Arctic isn’t only for frozen ice and polar bears, it can be also relaxing. 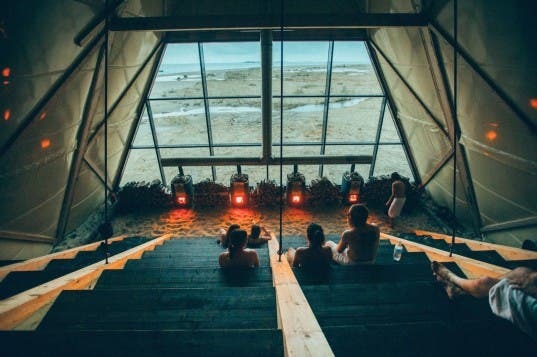 With that in mind, a giant “Agora” sauna was created for SALT, the world’s first Arctic arts festival on the remote Norwegian island of Sandhornøya. The creative design features a glass front on a timber structure and can accommodate 150 people; everything is designed in a local style. Created to celebrate an ‘Arctic state of mind,’ the SALT festival is a year-long event that features indigenous architecture, art, music, and food as well as some performances from international artists. Unsurprisingly, the sauna is one of the festival’s main attractions, also serving as an insulated fish rack and including a 100 person bar. When not used as a sauna or a bar, it can serve as a concert venue or even a library. 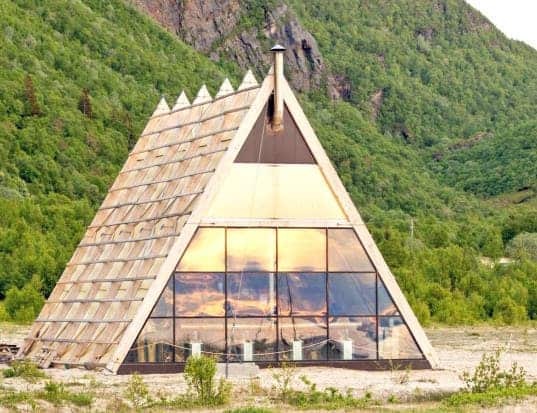 The Agora sauna is open to the public until September 2015, after which it will be moved to Greenland for a year.